342/365 – “Meet Shadow” nr.8, a photo by Luca Rossini on Flickr. Eight day of “Meet Shadow”. Agata has been sick for the last three days, hit by a fever that kept her quite off. 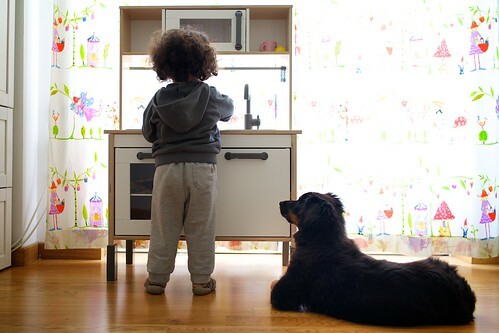 She didn’t obviously go to school all along, and I used these days to teach Agata and Ombra how to be and play together. It isn’t an easy task, Agata is in the age in which kids expect anyone and anything to understand what they say and to perform what they request, and I was expecting some major crisis, but I found that Agata is quite good with dogs and that Ombra is quite good with kids. At the end I didn’t have to do much but to find some common game they could play together, and the rest was quite easy. Today Agata woke up without fever and quite energetic, however we couldn’t allow her outside because of the cold wather. So we got some serious home-playing between the four of us all day long. 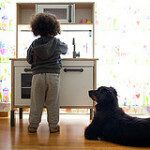 But it was when Agata decided to prepare Ombra’s meal with her toy kitchen that I took the camera. The funny thing is how seriously Ombra took the game, she waited all along, listening to Agata chatting, till finally she got served a little pan filled with toy vegetables and toy sausages. All but disappointed, Ombra bit the toy lettuce and attempted a joyful run, which sadly I had to interrupt for the sake of the lettuce.